Update your home décor with the youthful charm of this contemporary, barrel swivel chair. From its horseshoe shaped frame to its comfortable arms, this chair’s bold design is sure to stand out in any room. This handcrafted, barrel chair is also extremely comfortable due to its extra padded cushion and body. 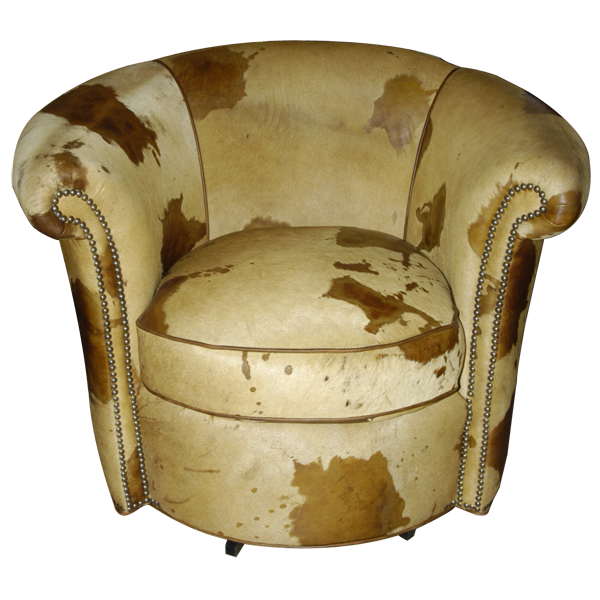 The entire chair is upholstered with beautiful, patterned, real cowhide. The upholstery is precision hand tacked to the entire wood frame by our skilled craftsmen. The wide, loose cushion, along with all of the leather in the chair, is double stitched for extra strength and durability. The entire chair rest on a durable quadripartite revolving support. The chair is guaranteed for life and is 100% customizable.